In the 1877 classic novel Black Beauty, audiences learned to empathize with the sufferings of a horse forced to pull cabs through London. Yet 137 years later, horse-drawn carriages are still popular in a number of cities around the world, including New York City. Even horse lovers will go for a horse-drawn carriage ride in the city, thinking of it as romantic and fun. Most people do not realize the hardships and suffering that horses working in NYC go through. The harsh reality is that horses are not meant to work long, difficult hours in an urban environment, and this work constitutes nothing less than animal cruelty. There are about 220 horses in NYC who work drawing carriages. They usually work about nine hours a day, seven days a week. At the end of the day, instead of being turned out into pastures as is healthy for horses, they are placed in stalls near the Lincoln Tunnel and West Side Highway. They do not have a chance to run around, roll, eat grass, or socialize as is normal for horses. Then, at the end of a long and tiring career, carriage horses do not get to retire out to a pasture somewhere. Instead, most worn-out horses are either slaughtered for dog food or sold to overseas slaughterhouses that will sell their meat to people abroad. , live their entire lives in an urban environment like NYC. The carriages they must pull are a very heavy load, and they must pull them all day across hard pavement, which is bad for their hooves and joints. Many drivers force their horses to work even in high temperatures, which have caused a number of horses to collapse while pulling carriages. The horses also breathe in exhaust from all the surrounding vehicles, which can lead to respiratory problems. In addition, the horses can be spooked by the many loud sounds characteristic of a large city. In addition to harming themselves, the horses can cause harm to their drivers, passengers, and nearby pedestrians. In fact, there have been a large number of accidents coming from horse-drawn carriages in NYC. In only the past two years, there have been over twenty reported accidents. These include horses spooking, crashing into taxi cabs, and falling to the ground. 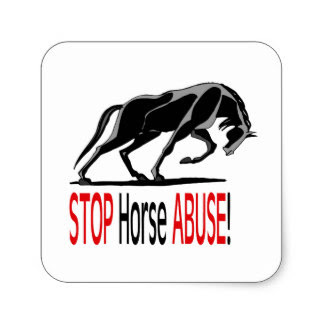 These incidents are dangerous to the people around and are clearly dangerous for the horses. It is simply not worth it to endanger so many beautiful animals and the people nearby in order to have horse-drawn carriages. Luckily, there are a number of great activists and organizations who are working to ban horse-drawn carriages and help NYC’s horses. Ashley Byrne has led efforts by PETA to educate the public about the condition of carriage horses and bring an end to their suffering. 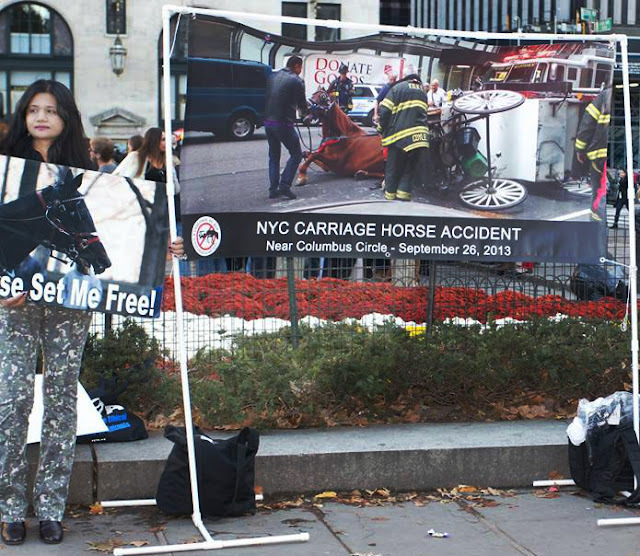 The great activists at NY Class, including Allie Feldman, have maintained a growing list of incidents involving horse-drawn carriages and encourage people to take action. The Coalition to Ban Horse-Drawn Carriages, led by Elizabeth Forel, is organizing to affect a ban on the cruel treatment of horses. In addition, Friends of Animals, a fantastic organization led by Campaigns Director Edita Birnkrant, has been organizing protests and keeping pressure on Mayor Bill de Blasio to enforce a ban. There are things that you can do to help as well. If you’re visiting New York City or another city that has horse-drawn carriages, do not pay for a ride in a carriage. It may seem like a memorable experience, but you are only contributing to the cruel treatment of that horse. If everyone were to stop taking carriage rides, the industry would soon collapse on its own. If you live in NYC, you can contact your local legislator and encourage them to support a ban on horse-drawn carriages. In particular, NYC mayor Bill de Blasio has claimed that he will ban horse-drawn carriages from New York City’s streets. You can call his office and ask him to keep his word. Horses are suffering every day, and many cannot afford to wait much longer to be freed from animal cruelty. There are many cities, including Key West, Palm Beach, Camden, and Biloxi that have already banned horse-drawn carriages. More and more people are recognizing them as animal cruelty, and enforcing a ban is certainly possible. It’s time that the residents and politicians of NYC care for their fellow creatures and take steps to end the cruel suffering of the city’s carriage horses.